Kenton Lloyd Boyer was born into a baseball-playing family on May 20, 1931, in Liberty, Missouri. He was the third oldest son in Vern and Mabel Boyer’s family of 14 children. Ken grew up in nearby Alba, Missouri, where his father operated a general store and service station. After he graduated from high school in 1949, Boyer was invited to a special tryout at Sportsman’s Park in St. Louis on the recommendation of Cardinals scout Runt Marr. Though Boyer could play both the infield and outfield, the Cardinals were more interested in his strong right arm and signed him as a pitcher who might play an occasional third base. The Cardinals signed him to a contract in 1949 for a $6,000 bonus, $1,000 under the limit that would have required him to be on the major-league roster for his first two seasons. Boyer was originally assigned to the team’s Triple-A club, the Rochester Red Wings, until a roster spot became available at a lower level. His older brother, Cloyd, was also with the Red Wings. Ken spent his time at Rochester on the bench until he was sent to the Cardinals’ Class D North Atlantic League club, the Lebanon Chix. As a pitcher he compiled a 5-1 record in 12 games with a 3.42 earned-run average in his rookie season. He struck out 32 batters but walked 34. At the plate, however, Boyer batted .455 (15 hits in 33 at-bats), hitting three home runs with nine runs batted in. Despite his prowess at the plate, the Cardinals still wanted to develop Boyer as a pitcher. Boyer spent his second minor-league season (1950) with the Hamilton Cardinals in the Class D Pennsylvania-Ontario-New York (PONY) League. His pitching record at Hamilton slipped to 6-8 with an ERA of 4.39. During the season, Hamilton needed a third baseman, and manager Vedie Himsl inserted Boyer into the lineup at third base in what was supposed to be a temporary move. The move became more permanent when Boyer displayed both the ability to hit and remarkable defensive skills at third. Boyer still pitched occasionally, but his batting average of .342 in 80 games, with nine homers and 61 runs batted in, helped his team to a third-place finish and a playoff berth. 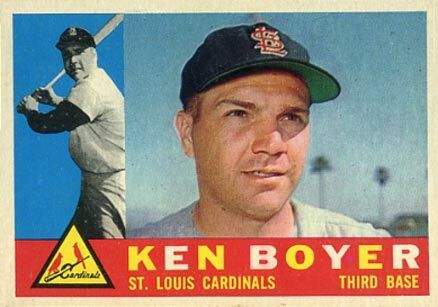 The Cardinals finally realized that Boyer was a better hitter than a pitcher, and in 1951 they promoted him to the Class A Omaha Cardinals in the Western League, where he would be their regular third baseman for the season. He started the season poorly, but with the help of manager George Kissell, Boyer improved both his offense and defense. He appeared in 151 games at Omaha and hit .306, with 28 doubles, 7 triples, 14 home runs, 90 runs driven in, and a .455 slugging percentage during his first full season as a position player. At the end of the 1951 season, Boyer was drafted into the Army during the Korean War and served two years overseas. He continued playing ball for the Army in both Germany and Africa. In April 1952 he married Kathleen Oliver. Out of the service in 1954, Boyer was assigned to the Houston Buffaloes of the Double-A Texas League. Former National League batting champion Dixie Walker was Boyer’s manager there. Walker made great strides with Boyer’s hitting technique, getting him out of an early-season slump and making him productive. Boyer played in 159 games for Houston and ended the season with a .319 batting average, belting 21 home runs and driving in 116 runs. He helped the Buffaloes win the postseason playoffs against the Fort Worth Cats, four games to one. After the 1954 season the Cardinals asked Boyer to play winter ball. He played for Havana, where his manager was former Cardinals coach Mike Gonzalez. Boyer’s winter-ball stint ended abruptly when a fastball hit him behind his left ear, resulting in a severe concussion that left him unconscious for three days. He made an unsuccessful attempt to resume play, but was forced to return home instead. In the offseason the Cardinals were so confident that Boyer would be their starting third baseman in 1955 that they traded Ray Jablonski, their incumbent third sacker, to the Cincinnati Redlegs, along with pitcher Gerry Staley, for relief pitcher Frank Smith. Recovered from his concussion, Boyer debuted with the Cardinals in 1955, joining, among others, teammates Red Schoendienst and Stan Musial. Boyer had a relatively good rookie year, appearing in 147 games and hitting .264 with 18 home runs and 62 RBIs. The next season he did not suffer the sophomore jinx as many young players do: Boyer’s second year in the majors was far superior to his rookie season. He appeared in 150 games, improving his batting average to .306 and finished the season with 26 homers and 98 RBIs. He was also selected to participate in his first All-Star Game. In 1957 Boyer volunteered to play center field to allow an exceptional rookie, Eddie Kasko, to play his natural position, third base. The Cardinals lost no defense in the outfield by this move; Boyer led all National League outfielders in fielding percentage that year. But Kasko was injured in 1958 and the Cardinals acquired Curt Flood from Cincinnati to play center field. Boyer returned to third base, where he won the first of five Gold Glove awards. Boyer hit .307 in 1958 and .309 in 1959. He hit 51 home runs those two years and in 1958 drove in 90 runs. That same year Boyer participated in 41 double plays, which equaled the second highest total in National League history to that point. In 1959 he had a 29-game hitting streak for the Cardinals, four shy of the team’s record held by Rogers Hornsby. Boyer was named to 11 All-Star squads covering seven seasons – 1956, 1959-64. In 1960 and 1961 Boyer led the Cardinals in batting average (.304 and .329), home runs (32 and 24), and RBIs (97 and 95). His .329 batting average ranked third in the National League in 1961. Boyer also became the team captain during this period. Although Boyer’s statistics dropped in 1962 and 1963, he still had stellar years. He missed only two games during the 1962 season and three in 1963. His average fell below .300 in both years, but he hit a solid .291 in 1962 and .285 the following year. He hit 24 home runs in each year (in fact, Boyer hit 24 round-trippers in each season from 1961 through 1964). In 1962 and 1963 his runs batted in were among the highest of his career—98 in 1962 and 111 in 1963. By far Boyer’s greatest season in the major leagues was 1964, when, playing in every one of the Cardinals’ 162 games, he helped lead the team to its first pennant and World Series title in 18 years. That year he topped the National League in RBIs with 119 (the first National League third baseman to accomplish that feat since Heinie Zimmerman in 1917)and batted .295. He also won his only MVP Award. Boyer’s 1964 season was climaxed by his clutch performance in the World Series against the New York Yankees. In Game Four, he hit a grand slam off Al Downing to give the Cardinals a 4-3 victory. In the decisive Game Seven, Boyer had three hits, including a double and a home run, and scored three runs as the Cardinals won the Series. Ken’s brother Clete — playing in his fifth consecutive World Series in 1964 with the Yankees — later admitted that he was privately thrilled for his brother because it was Ken’s first World Series. Clete also homered in that seventh game, the only time in World Series history that brothers have homered in the same game. Clete had a 16-year career in the major leagues. He debuted with the Kansas City Athletics on June 5, 1955, and made his final major-league appearance with the Atlanta Braves on May 23, 1971. His career figures were .242, 162 home runs, and 654 RBIs. Ken’s older brother, Cloyd, also played in the major leagues, pitching for the Cardinals from 1949 to 1952, and for the Kansas City Athletics in 1955, the year that brothers Clete and Ken both made their major-league debuts. Over five seasons, Cloyd won 20 games and lost 23 with an ERA of 4.78. Four other Boyer brothers had brief experiences in the minor leagues, but went no further. In 1965, Ken’s 11th year and final year with the Cardinals, he began to suffer from back problems. His batting average dropped to .260 and his power numbers dipped to 13 home runs and 75 RBIs. After the season the Cardinals traded Boyer to the New York Mets for pitcher Al Jackson and third baseman Charley Smith. Boyer fans criticized the trade, recalling all his accomplishments over the years. Cardinals manager Red Schoendienst defended the trade as necessary, claiming that the Cardinals had received two good players in return for Boyer—a power-hitting third baseman in Smith and an excellent starting pitcher in Jackson. At the time it was the biggest trade in Mets history. Bing Devine, the Mets’ general manager, thought an older Boyer (he was 35) might bring veteran leadership to his young team and perhaps regain his own MVP form as well. Boyer played in 136 games for the Mets in 1966, including two at first base. He hit .266 with 14 home runs and 61 RBIs. The Mets finished that year in ninth place, ahead of only the cellar-dwelling Chicago Cubs. Boyer began the 1967 season with the Mets, appearing in 56 games before being traded on July 22 to the pennant-contending Chicago White Sox for Bill Southworth. Each team included a player to be named later in the deal. On August 15 the Mets sent Sandy Alomar to the White Sox; on November 27 the White Sox sent J.C. Martin to officially complete the deal. Boyer’s stint with the White Sox marked the only time he spent in the American League. His manager in Chicago was Eddie Stanky, who had managed him in his rookie season with the Cardinals. The White Sox were in first place until August 13. They regained the lead about a week later, but eventually fell to fourth place. Boyer played in 57 games for the 1967 White Sox and hit .261 with four home runs and 21 runs batted in. Boyer began the 1968 season with the White Sox, appearing in 10 games before he was released. On May 10 he signed with the Los Angeles Dodgers with the understanding that he would be a pinch-hitter and bench player, not a regular. Under manager Walt Alston, Boyer split his time between third base and first base and appeared in 83 games. For the Dodgers he hit a respectable .271 with six home runs and 41 runs batted in. Boyer returned to the Dodgers in 1969 for the final season of his 15-year major-league career. The 38-year-old appeared in only 25 games for the Dodgers in 1969 (all but four as a pinch hitter), and batted .206. The Dodgers asked him to return the following year as a coach, but he informed the team that he wished to pursue a possible managerial career in the minor leagues. On October 8 the Dodgers gave Boyer his unconditional release. In the offseason the Cardinals hired Boyer as a coach of their Arkansas affiliate in the Texas League. He then coached with the big-league team for two seasons before returning to minor-league managing. The Cardinals replaced manager Red Schoendienst after the 1976 season with Vernon Rapp, a known taskmaster. Many had felt that Boyer would replace Schoendienst. The disappointed Boyer was hired instead by the Baltimore Orioles to manage their Triple-A farm club, the Rochester Red Wings, in the International League. Rapp managed the Cardinals to a third-place finish in 1977. The following year Cardinals owner August Busch decided to fire Rapp after he had compiled a record of 6-11. According to catcher Ted Simmons, “Rapp was a disciplinarian, and in a major-league clubhouse it’s difficult to be one.” On April 29, 1978, Busch named Boyer the new Cardinals manager. The Cardinals finished the 1978 season in fifth place, but in 1979 he guided the team to 86 victories and a third-place finish. The team began the 1980 season slowly, and on June 8, between games of a doubleheader in Montreal, with the team’s record at 18-33, Cardinals general manager John Claiborne appeared in the clubhouse and informed Boyer that he was fired and that Whitey Herzog was the club’s new skipper. Boyer compiled a record of 166-190 in three seasons (1978-1980). Boyer remained in the Cardinals’ organization as a scout through 1981. He was slated to manage their Triple-A team at Louisville, but had to decline when he was diagnosed with lung cancer. Boyer died on September 7, 1982; he was just 52 years old. Two sons and two daughters survived him in addition to his brothers and six sisters. In 1984 the Cardinals retired his number 14, which he wore throughout his career with the team. He is the only player whose number has been retired by the Cardinals who is not in the Baseball Hall of Fame. Boyer’s name was on the Baseball Writers Association of America’s Hall of Fame ballot for 15 years, from 1975 through 1994. His highest vote percentage was 25.5 percent in 1988. (Seventy-five percent is the minimum required for membership.) It will require the vote of the Veterans Committee for Boyer’s admission into the Hall of Fame. Two of Boyer’s former teammates were among his most ardent supporters. Stan Musial said, “The ballplayers know he’s a good one, but nobody else does.” Tim McCarver said, “He was the boss of our field. He was the guy everyone looked up to. He was the guy who really filled that role, if that role needed to be filled.” Musial and McCarver summed up the problems with Ken Boyer—a quiet man who just did his job well without any fanfare. Gary Gillette and Pete Palmer. The ESPN Baseball Encyclopedia, Fifth Edition. New York: Sterling Publishing, 2008. Peter Golenbock. The Spirit of St. Louis: A History of the St. Louis Cardinals and Browns, New York: Avon Books, 2000. David Halberstam. October 1964, New York: Villard Books, 1994. Rob Raines. The St. Louis Cardinals, New York: St. Martin’s Press, 1992. New York Times, September 8, 1892. John Thorn, Phil Birnbaum, and Bill Deane, eds. Total Baseball, 8th /Edition. New York: Sports Classic Books, 2004.